Justin's question in panel five has been a long, long time coming. Maybe not that EXACT question, but when you think about it, Mr. Verres has divulged a LOT of secrets to people who, when you really get right down to it, he shouldn't be telling. He doesn't see it that way, however, as evidenced by panel six. 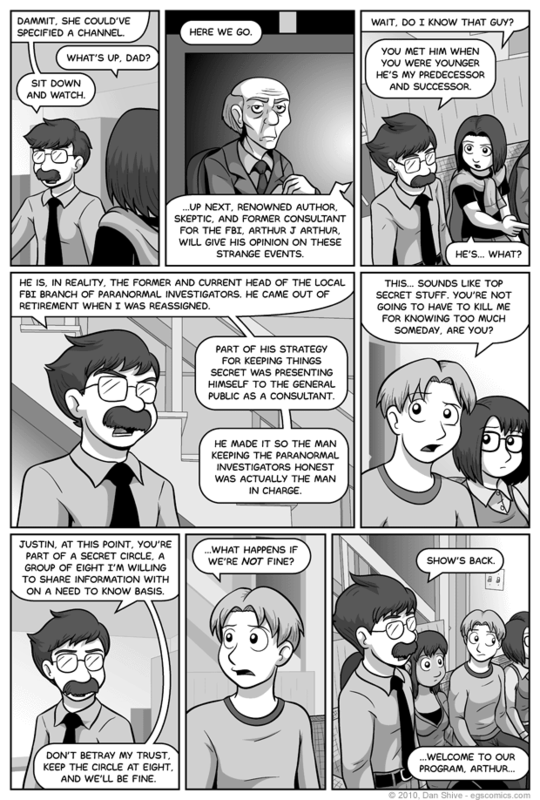 This is also the first time in-comic that anyone has effectively defined the "main eight" of the comic that I often refer to, those eight being Elliot, Ellen, Sarah, Tedd, Grace, Susan, Nanase, and Justin. I wanted to squeeze in a joke about octagons in this comic, but alas, I ran out of room. That, and I'm probably the only one who would've laughed. Arthur's been in two previous sketchbooks, found here and here. The first drawings of him were intended as being for a different character, but I liked the design and wanted to use it for this character as opposed to this character (who is literally brain dead and only moving due to a parasite, hence not much staying power). When this comic was originally posted, Arthur had long hair, which I felt made him look too similar to Sirleck's host, so I edited it to give Arthur shorter hair. I figured it was a pretty easy edit to make now, whereas if I left it unchecked, it would just be needlessly confusing. In my defense, however, it's a known fact that all elderly men are balding and have shoulder-length hair. ANYWAY, I don't know if the "consultant who is actually in charge" angle has been done before, but it wouldn't surprise me. This character's status as a public figure was pretty much written backwards from this scene, so it was born less out of "hey, that's a cool concept" and more out of "hey, this makes this scene work". That's the sort of thing one should be careful about, but it opened up a lot of other possibilities that I liked, so here we are. Incidentally, Arthur's been brought up in the story before. I don't know about you, but I get giddy every time I can link to foreshadowing for this storyline from the first two primary storylines of Bringing Silly Back. It almost makes me look like I know what I'm doing.